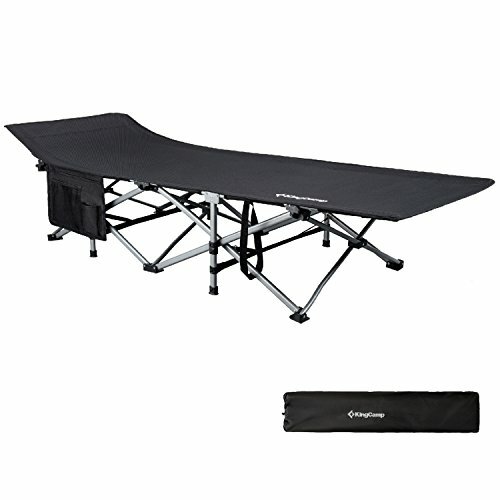 KingCamp Camping Cot Oversized Heavy Duty Folding Bed is perfect to be used indoors, or bring it outdoors such as park, beach, backyard, garden, camp site. The bed only weight 15 lbs and after folded the size only has 45 x 9 x 7 inches which makes it portable and light enough to be carried like a small luggage on a trip, fits in most car trunks, satisfying your camping needs. High strength steel&Aluminum tubes bracket and triangle structure makes it firmly stand on the ground. The bed with ten feet and 1200D Jacquard Oxford fabric has sufficient bearing capacity ,look more beautiful and loading weight up to 440 lbs. No tools needed! With the folding design, the camping bed is easy to open or fold in seconds whenever you want. There is a 3-in-1 pocket for your magazines, phone and drinks.